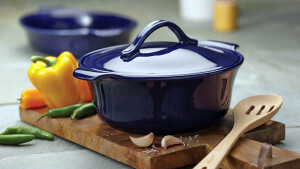 Win A Stoneware Casserole Dish from Anolon! One of my kitchen essentials is my covered casserole dish, that I use to make so many wonderful meals. That’s why I am so excited to see today’s giveaway – the 2.5-Quart Round Covered Casserole Dish from Anolon’s Vesta Stoneware. The 2.5-Quart Round Covered Casserole Dish provides an extraordinary oven-to-table presentation by its elegantly tapered walls with tulip-flared rims and curved handles that offer plenty of room for potholder grip. Oven safe up to 500 degrees Fahrenheit, this giveaway is made of highly durable, non-reactive and stain-resistant stoneware. Not to mention, this covered casserole dish is microwave, freezer, and dishwasher safe. You can experience a whole new world of flavors in Anolon’s superior bakeware offered in solid color glazes inspired by fine foods and seasonings including Paprika, Persimmon, and Baltic. Two Appetite for Health fans will have the chance to win a 2.5-Quart Round Covered Casserole Dish from Anolon’s Vesta Stoneware. Tell us in the comment section below this post (not on the Facebook site) why you need Anolon’s 2.5-Quart Round Covered Casserole Dish in your kitchen! Share this (or any other post on our site) with someone you think would be interested in our health and nutrition information. Oh I really need the covered casserole dish! Not so much for me but to give to my beautiful daughter-in-law who feeds my wonderful son and their combined family of six kids! She needs all the dishes she can get! Lol. Thanks App4H! This wonderful covered casserole dish would be so practical and well used for our family dinners. Making tasty and healthy dinners of chicken and vegetables is ideal with this beautiful dish. I need the 2.5-Quart Round Covered Casserole Dish to seal in goodness and flavor as the nutritious recipes I love the most are made in the Oven. I need Anolon’s 2.5-Quart Round Covered Casserole to make green bean casserole for holidays. I would love this dish to make my favorite salsa chicken cassarole ! i would love to get the 2.5-Quart Round Covered Casserole Dish because i would use it all the time. I love stoneware. It’s great for baking everything from cozy dishes – like shepherd’s pie – to desserts like cobbler. Please they help keep warmth to keep foods at temp during parties. I need it because I only have one other one and lost the lid to it. I need the Anolon’s 2.5-Quart Round Covered Casserole Dish to make pot roast. I need this because the size is just right for so many things, right now I only have a glass rectangle baking pan for in the oven cooking, and normal saucepans to cook on stovetop, I don’t have anything this size for either in oven or stove top cooking, it would be a huge help. I would love to have this covered casserole dish because it’s a great size and would be so practical. It also would look really good while being useful. I definitely do need this because I do not have a covered baking dish at all. I only have a 13×9 baking dish and another one smaller than that. That’s it! What a treat it would be to own a beautiful dish like this one. It would fit a perfect need! I need Anolon’s 2.5-Quart Round Covered Casserole Dish in my kitchen because I love to cook and I do’t have one Of these. I have always wanted one, maybe i will get lucky and win one! Like you on FB too! During the holiday season, I can never have enough casserole dishes. We end taking so many dishes to so many places, and having a beautiful dish do to so in would be even better. What a versatile size and style! I am always looking for serving dishes that are attractive for table use as well. I’ve always wanted one of these and would be perfect for cooking Holiday dinners! This would be perfect for the squash/apple dish that I make at Thanksgiving! Oven to table…I need that! Several recent moves, and I’ve either broken or lost many of my casserole (and other) dishes! This would be a significant improvement on what I’m using now! I would love to add this beautiful stoneware to my kitchen! I love to cook! We’re hoping to have a new home for the new year, so this is an essential! Thanks for the chance! I haven;t bought any new dishes in a while so I could use this casserole dish. I need this because I have no cookware that is oven to table apart from a pie dish. I would like to make turkey barley soup in this post-Thanksgiving, and I would also like to experiment with some diverse casserole recipes. I need Anolon’s 2.5-Quart Round Covered Casserole Dish in my kitchen to prepare a healthy & delicious dessert for our Christmas gathering; I plan to make your Apple Raisin Crumble recipe (http://appforhealth.com/2015/11/apple-raisin-crumble/) in smaller batches and serve out of the pretty Casserole Dish on the table. I have “Liked” Appetite for Health. Because it would get so much use at our house. I need this Anolon’s 2.5-Quart Round Covered Casserole Dish in my kitchen because I could use it to make the best casserole – not to mention I like that it’s oven safe up to 500 degrees Fahrenheit, and it’s made of highly durable, non-reactive and stain-resistant stoneware. This lovely dish would be a beautiful addition to my kitchen; however, if I win, I will give this to my daughter–she will love it! I need this Stoneware Casserole from Avalon so I can cook some hot dishes during the rainy El Niño weather we’re expecting in SoCal! 2.5 quarts is the ideal size for our clan…or for a potluck. Plus, I like that blue color. I’d love to have a new casserole dish to make a roasted winter vegetable and grain dish. I haven’t had a new casserole dish since I moved out on my own in the early 80’s. I don’t have a casserole dish this size with a lid and would love to own one. It’s just the right size for my family and I can see myself using it several times a week. I definitely need one of these! I love baking casseroles and roasting lean meats with veggies in the oven, and I’ve gone through three different covered ceramic dishes already! The Anolon stoneware is known for its durability, so I’d love to own one. My favorite dish to make in the oven during fall is roasted turkey breast with sweet potatoes and onions (the casserole lid allows the meat to stay moist and tender without using butter or extra fat!). I share your healthy recipes with my friends and family all the time, but I’m going to send them a few more today! Thanks! I need it because I still use my old corningware with the blue flower decoration. It’s time to update. This would be perfect for my potatoe casserole! I need this casserole dish because I just moved and had to leave behind a lot of my old dishes and pans. I need to get new casserole dishes and this would be a great new start. I love cooking in these stoneware dishes, the one I have is too large and this would be perfect for those small dishes during the week. I would love to have this to make small portions. I could use it for beans, veggies and rice. Perfection! I need this because in addition to being great to cook in, it would be so pretty to serve in. I would use this bakeware to cook many of my favorite dishes. It is quite pretty as well! I need this dish in my kitchen because I recently moved into my first apartment and don’t have a lot of cookware. I would really love this for my daughter, who is 10x the cook I am and adores making home-cooked meals for her children!! On limited budgets, we can’t just go out and get decent cookware. I’d like this because I don’t have a casserole dish with a lid. This would be so handy to have. I need Anolon’s 2.5-Quart Round Covered Casserole Dish in your kitchen so that I can make some amazing casseroles! It’s a great size for making some wonderful soups I grew up with like albondigas. I need this so I can make stew. I would love to get the 2.5-Quart Round Covered Casserole Dish because it would be wonderful for my roast! It would be awesome to win the Anolon covered casserole dish. My daughter & 1 yr old son moved back home with us. She has celiac & on gluten free diet. The dish would be used for her gluten free meals to prevent cross contamination from our dishes. Being a covered dish would be great for planned left overs. This would be ideal for making my pork loin! I need Anolon’s 2.5-Quart Round Covered Casserole Dise in my kitchen because I could cook a lot of my husbands favorite dishes!! I take casserolse to dinners about twice a month. It would look so appealing in this dish! I need it because I think that the curved handles are nice and I think this would be great to cook with. I would love Anolon’s 2.5-Quart Round Covered Casserole Dish in my kitchen because my daughter is learning to cook vegan meals and this would be useful for her. I Like” Appetite for Health on Facebook! I need this beautiful 2.5-Quart Round Covered Casserole Dish in my kitchen because I don’t own not one piece of stoneware and I love the fact that it is highly durable, non-reactive and stain-resistant stoneware. and better yet, microwave, freezer, and dishwasher safe! I shared this post by sending it to a friend’s email address! I could use a casserole dish period. This would come in handy for Thanksgiving! Perfect for making a good pot of stew this winter. This would be wonderful to have to feed my two growing boys! It looks like a great size and it’s very pretty. I shared this post on FB. I don’t have a covered casserole dish, so this would be great to have. I would love to have it for myself, but I would give it to my sister. She really needs it! She just moved in with our Mom, and all Mom’s dishes and pans are old as dirt. I love to make small portions when I bake things and this would make a nice side dish to do that in that’s why I need this Covered Casserole Dish and also I’m low on baking dishes now a days. This would be such a beautiful and easy way to make delicious weeknight dinners. I don’t own anything like this and would love to add it to my kitchen! I would love to make a creamed chicken and broccoli casserole with shredded cheese! I also shared via tweeting your link – thank you so much as this would be very helpful this Christmas! I need this great 2.5 quart Anolon covered casserole to make chicken with 40 cloves of garlic! None of my pans are able to go from stovetop to oven because of their handles. I research recipes and try to cook healthy meals every night. A high quality casserole dish would be a welcomed addition to my kitchen. I actually don’t own a covered casserole dish, so I really need one! It would be great for making lasagna and so many other things! This would be great for cooking in the winter–I love that it s oven safe and yet so beautiful!!! I’ve wanted one of these for a long time! It would be great to cook meat, soup or any one pot dishes for us! Most of my cookware containers are small. This would be great for our feasts and family gatherings. I make a lot of soups and stews and these would be perfect for them. Not to mention that they would look really nice on the stove. I need this Anolon 2.5-Quart Round Covered Casserole Dish for making casseroles, soups and stews! It’s perfect for making my husband’s favorite Gluten Free Turkey and Spinach Quinoa Casserole that I make with the left over turkey from Thanksgiving! I love the elegant design as it would look fabulous on our holiday table! Thank you for this amazing giveaway! I would love to win it for my moms birthday! Growing up with so many casseroles and soups. I would love some more cooking lessons. I need this so my baked veggies taste amazing. I love to make casseroles and oven dishes but it all starts with the right tools. This would be great to make homemade cheesy lasagna in with eggplants and tomatoes too! I shared on my FB wall as well. Thanks so much. I could really use this casserole dish because I don’t have anything like this. I have no stoneware in my house, and I don’t make any casserole dishes now because I don’t have anything to cook them in. I’m never quite sure how to make them, but having something like this would be a fantastic way to start cooking dishes my mom used to make! I’d love to be able to start doing that for my family!! I need this casserole dish because it matches my decor in the kitchen and my casserole dishes have seen better days. Time to add a fresh look to the kitchen and serve up some great healthy food. I need this casserole dish for my soups, stews and chili.